What I couldn't have predicted, though, was how in the days to come the Creature Creator would captivate the rest of my family. One evening I came home from a late night at the office to find that my wife had fired it up and painstaking designed an absolutely gorgeous birdlike creature. Over the next few nights we fought over the PC, taking turns with the software. I built nasty little golems that bristled with hostile appendages, while she sculpted lovely, fantastical animals. My eight-year-old daughter saw what we were up to and became similarly hooked. She's built herself an entourage of fairy-tale beasts and cute little Pokemon-esque companions. Like us, she's absolutely enamored by her homegrown pets. We've amassed quite a collection together over the past few weeks. Several dozen creatures in all, each entirely unique, shaped and molded according to our individual desires. Our family's Sporepedia page resembles a warped sort of Noah's Ark, full of zany, unisex animals just waiting to populate new Earths. Now that we've got this collection of creatures, we're dying to set them free. Two months from now, we'll be arguing over whose creation gets to be the first to set foot on the next planet, or venture into space, or gobble up single-celled victims. The Creature Creator's friendly and flexible features bode extremely well for the rest of the Spore experience, but it's still tough to know whether guiding microscopic organisms, managing small tribes, or populating whole planets will be as enjoyable. There's too much we don't yet know. How exactly do species transition from one arena of scale to the next, for example? How rigid are the evolutionary requirements? How large is the universe that I can personally explore? How will content be shared from one user to the next? I don't know the answers to these questions, but I'm intrigued by EA Maxis' lofty promises. 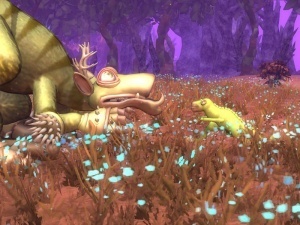 I can't wait to see the rest of Spore in action. And given that over one million creatures were uploaded to the Sporepedia in the week following the Creature Creator's release, it looks like droves of PC owners are as excited as I am about the prospect of exploring Wright's latest virtual playground. I wouldn't have predicted that kind of enthusiasm. I'd be surprised to see Spore find retail success on the same scale as The Sims franchise, but I wouldn't be astounded. If the rest of the game taps into basic (dare I say primordial?) creative urges as successfully as the Creature Creator, Spore's retail successes could be as huge as its ambitions.